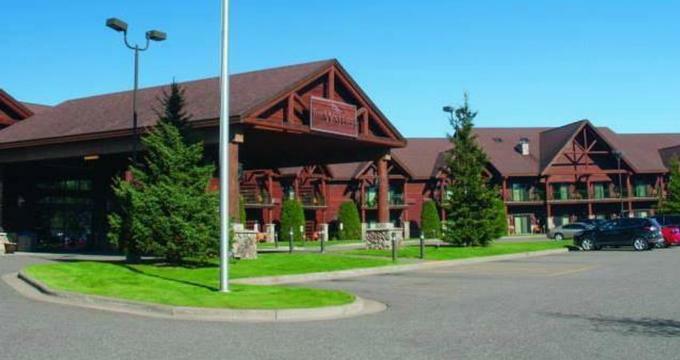 Nestled in the heart of scenic northern Wisconsin, the Waters of Minocqua is a pet-friendly hotel located just a short walk from the shores of Lake Minocqua. Featuring a fun indoor-outdoor water park with two waterslides, a children’s play area, and a wealth of other family-friendly facilities, the Waters of Minocqua offers a relaxing getaway for the whole family. Situated within a short distance from many top attractions in the area such as the town of Minocqua, Lake Minocqua, the Wildwood Wildlife Park & Zoo, and the Timber Ridge Golf Club, the Waters of Minocqua features well-appointed guest rooms with carpeted floors and handcrafted wooden furnishings, sitting areas with modern amenities, and private balconies with appealing views. Facilities at the Waters of Minocqua range from the Rendezvous Pub and Eatery, which serves delicious American cuisine and specialty drinks for breakfast, lunch and dinner, a fully equipped fitness center with cardiovascular equipment and free weights, a games arcades, and modern meeting spaces for special events and functions. The Waters of Minocqua features well-appointed accommodations in the form of guest rooms and suites with contemporary décor and handcrafted log furniture, en-suite bathrooms, modern conveniences and private balconies with beautiful views. Rooms types range from Standard and Deluxe Queen Rooms and King and Whirlpool King Suites to King and Queen Loft Suites and Double Queen Fireplace Suites. All accommodations feature king or queen-size pillow-top beds dressed in luxury linens and hypoallergenic pillows, and en-suite or shared bathrooms with walk-in showers, soaking tubs, or combinations of both, fresh towels, bathrobes, and organic bath products. Modern amenities include LCD televisions with cable channels, mini-fridges, microwaves, coffeemakers, hairdryers, irons and ironing boards, telephones with voicemail services, and complimentary wireless Internet. Queen and King Whirlpool Rooms have queen-size pillow-top beds dressed in luxury linens and hypoallergenic pillows, and en-suite bathrooms with walk-in showers jetted tubs, or combinations of both, fresh towels, bathrobes, and organic bath products. Private decks and balconies overlook the grounds and offer peaceful views. Queen Standard Rooms are decorated in a distinct Northwoods style with handcrafted wooden furniture and feature queen-size pillow-top beds dressed in luxury linens and hypoallergenic pillows, and en-suite bathrooms with walk-in showers jetted tubs, or combinations of both, fresh towels, bathrobes, and organic bath products. Private decks and balconies boast beautiful views of the grounds. Queen Deluxe Rooms have separate living room areas with sofa sleepers for additional guests, LCD televisions with cable channels, mini-fridges, microwaves, coffeemakers, hairdryers, irons and ironing boards, telephones with voicemail services, and complimentary wireless Internet, and private outdoor deck or balconies with views. Queen Fireplace Rooms add fireplaces for romantic charm, and feature one or two queen-size pillow-top beds dressed in luxury linens and hypoallergenic pillows, and en-suite bathrooms with walk-in showers, jetted tubs, or combinations of both, fresh towels, bathrobes, and organic bath products. King and Queen Loft Suites offer multiple kings or queen-size beds dressed in luxury linens and hypoallergenic pillows, and one-and-a-half bathrooms with walk-in showers jetted tubs, or combinations of both, fresh towels, bathrobes, and organic bath products. Sitting areas have sleeper sofas for additional guests, and romantic fireplaces and modern amenities such as LCD televisions with cable channels, mini-fridges, microwaves, coffeemakers, hairdryers, irons and ironing boards, telephones with voicemail services, and complimentary wireless Internet. Loft Suite with Three Queens boasts the ambiance of a cozy log cabin and feature three queen-size beds dressed in luxury linens and hypoallergenic pillows, one-and-a-half bathrooms with walk-in showers, jetted tubs, or combinations of both, fresh towels, bathrobes, and organic bath products, and spacious living rooms with sleeper sofas for additional guests, and romantic fireplaces. Modern amenities such as LCD televisions with cable channels, mini-fridges, microwaves, coffeemakers, hairdryers, irons and ironing boards, telephones with voicemail services, and complimentary wireless Internet. Private outdoor deck or balconies have beautiful views. Two Room Suites have private bedrooms with king-size beds dressed in luxury linens and hypoallergenic pillows, and en-suite bathrooms with walk-in showers jetted tubs, or combinations of both, fresh towels, bathrobes, and organic bath products. Separate living areas have sleeper sofas for additional guests, private balconies with views and modern amenities include LCD televisions with cable channels, mini-fridges, microwaves, coffeemakers, hairdryers, irons and ironing boards, telephones with voicemail services, and complimentary wireless Internet. The Waters of Minocqua offers a wealth of amenities, facilities and guest services, including The Waters Arcade and Redemption Center with over 40 games and other forms of entertainment, The Waters Pub, which serves menu of all-American cuisine, including burgers and pizza, for dinner throughout the week and also offers a room-service and take-out menu. The Waters Coffee Shop serves coffee, tea, hot drinks and snacks throughout the day. Facilities include an indoor-outdoor waterpark, a games arcade, a fully equipped fitness center, firepits and barbeque grills, modern meeting and conference facilities, an outdoor wedding venue, a business center equipped with computers and printing, copying and faxing services, and a gift shop. Guests are treated to a hearty complimentary breakfast every morning, and there is free high-speed wireless around the property. With spectacular, beautiful gardens and grounds, luxurious accommodations, a full-service bar and restaurant, and professional and knowledgeable staff, the Waters of Minocqua offers an ideal venue for weddings, receptions, ceremonies and corporate functions.